Don’t want to settle for just one type of meat? Then don’t. 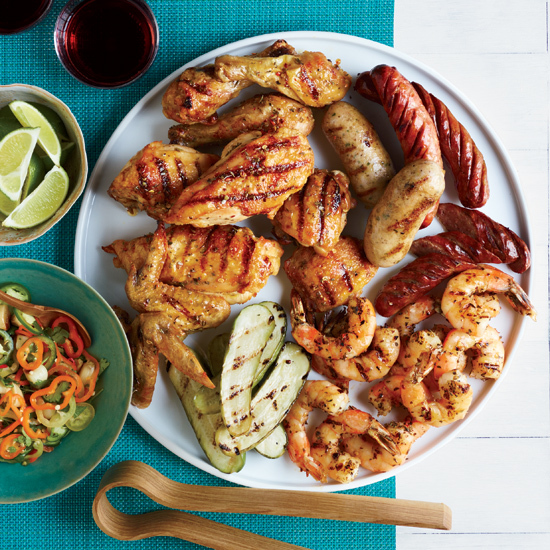 Grill them all with this delicious recipe. Tailgating can mean simply grilling up a few hot dogs and burgers. Or tailgating can mean meat heaven. For those who want to appease the tailgating gods properly, here are eight masterful meaty dishes. Tailgating can mean simply grilling up a few hot dogs and burgers. Or tailgating can mean meat heaven. For those who want to appease the tailgating gods properly, here are eight masterful meaty dishes. And to do any grilled meat justice, follow Rick Bayless’s tips for creating perfect grill marks. Thick and juicy hanger steak is delicious with a spicy-sweet glaze. These giant steaks aren’t fooling around. Easy to prep in advance, these spicy lamb chops are perfect for tailgating—they come with their own handle. These juicy chopped lamb steaks can be eaten with a knife and fork, or on top of bread that’s been spread with tangy goat cheese. A combination of paprika and ancho chile powder enhances the meat’s smoky grilled flavor. These exceptional grilled pork tacos are topped with grilled pineapple.